Flying through the sky in a pressurized metal tube is hardly a comfortable experience. Couple limited legroom with recycled air and turbulence, and traveling hardly occupies a romantic place in your mind. But one of the last great solaces of flying, a prohibition of in-flight cell phone calls, appears to be more firmly in place after the Federal Communication Commission (FCC) ended consideration of a proposed lift on the ban Monday. In 2013, the FCC floated the idea of repealing the ban on cell phone calls onboard commercial flights, which was first implemented in 1991. In large part, the prohibition on cellular service is a holdover from an earlier era, when cell phone signals posed the threat of muddying communication between air traffic controllers and pilots. 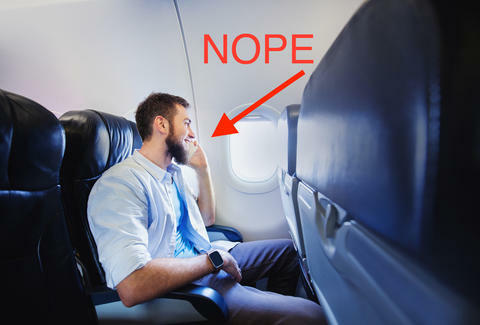 Nowadays, though, there are cell phone towers onboard most planes to accommodate in-flight entertainment, meaning you could theoretically hold a conversation at high altitude for as long as you want, pending your phone has enough juice. This is all to say that it was never all that convenient to make calls while blasting through the ether on a crowded flight in the US. But given the tenor of things at the FCC, it appears like you won’t get the chance for the foreseeable future.